White flour is the most important in bread making. Wheat contains gluten, which is the name given to the protein content. When the grain is ground into a fine flour, the gluten is elastic and has the power of stretching and expanding; making it ideal for bread making since it retains the air and carbon dioxide and hardens on baking, forming the framework of the loaf of bread. The protein in corn and oats lacks this quality and therefore they are combined with white flour for baking purposes. 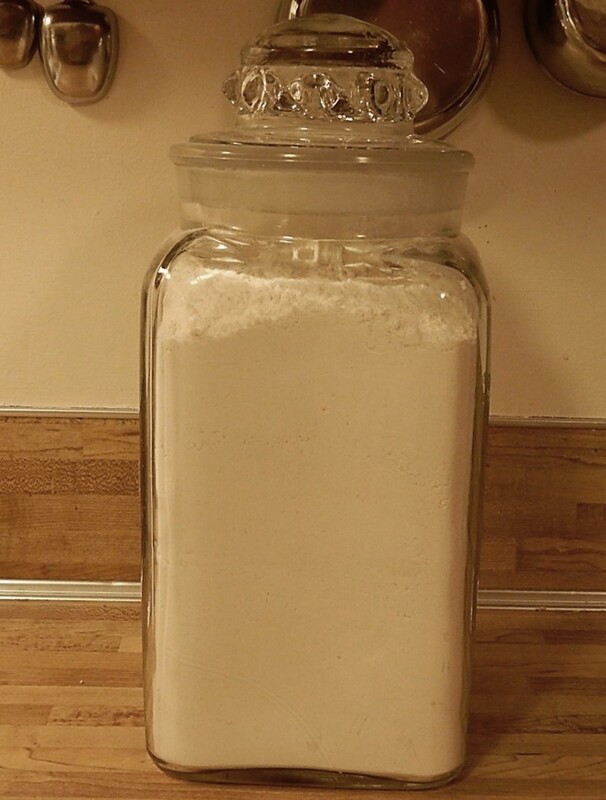 Rye flour may be used alone or with white flour in bread making. It seems as if good old-fashioned wholemeal flour wasn’t an option. I am surprised. It does seem like white bread was the norm. Maybe whole wheat bread was considered “old-fashioned” a hundred years ago. As one that has to eat GF bread, which is awful and feels like a brick in the stomach, I agree that white flour makes light and airy bread. Maybe not the best for you as many nutrients are removed, but it sure is good. Now let’s talk cake…a distant memory for me. Why are all the things that are tasty not good for us? I experienced the difference the first time I ran into cornbread made strictly with cornmeal. I don’t think that I’ve ever had cornbread made with 100% cornmeal. I did once make a hundred-year-old cornbread recipe that contained no sugar. I didn’t care for it. I think that sugar is an integral part of good corn bread. I find that I can use half fresh ground wheat and half white bread flour that it is still light not heavy as in using all wheat. I also have found that bread made with a mixture of whole wheat and white flour is tastier.. Your bread sounds wonderful. I’ve never ground my own flour. There is nothing like bread made with white flour. However, a while back when I resolved to lose 10 pounds, I gave up all bread, pasta, potatoes, heavy cheeses, and sugary snacks Monday through Friday (ate what I wanted on weekends), and an unexpected side effect was I stopped feeling bloated! I felt light! It’s hard to explain. Unfortunately, I started losing too much weight and so had to start eating that stuff so I didn’t waste away. Although now that I’m writing this I’m realizing that, given the fact that I gave up several things at once, it could have been anything. Maybe I should give up one a week and see what it might be. At the time, I thought it was the gluten. I like how you gave yourself a vacation from dieting on the week-ends. It’s so hard to know exactly how different foods affect. us. This post gears toward the bread-MAKing, not the bread-TASTing 🙂 Whole grain/multi-grain/peasant breads taste better (to me), but maybe the ease of kneading overrode all else to housewives one hundred years ago. I am a fortunate person who can tolerate gluten. Funny how in the last generation that’s become such a health issue. White flour was relatively new in the early 1900’s, so white bread was probably considered best because it was modern and trendy. Until the 1870’s, people used stone ground wheat. As technology improved, flour mills figured out how to remove the wheat germ and fiber to make white flour. Here’s a history of white flour on the Pioneer Thinking website. Whatever would they think about all the many types of flours we have today? !